The planet hung, suspended in space, turning slowly on its axis...while more distant stars twinkled in the background. Strange stars. Unfamiliar stars. "There," the president of the Earth Jewish Council, Mr. Nachum Koch, said, pointing at the holographic image of the planet with his forefinger. "Beta Centauri C. A scout ship made planetfall there just three days ago, and there are definite plans to colonize it. We need to organize a Jewish delegation to join the next ship that's going..."
Five years later, the huge colony ship, the Expedition, starts out on its journey. On board are thousands of pioneers ready to populate the promising new planet, including two hundred frum Jews who will establish its Jewish community. They set off with high hopes for the future, oblivious to the danger that is lurking within the ship - an imposter whose mission is sabotage. Koby Fein, fun-loving, adventurous, and easily bored, has boundless energy and a never-ending need for excitement. Though his older sister Shifra is miserable about their one-way journey, Koby is thrilled. But life on the spaceship quickly loses its allure, and Koby sets out to find some action. 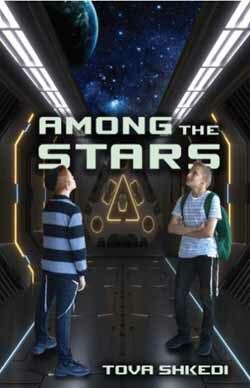 When he convinces his new friend Gavriel to stow away with him on a short shuttle ride, he gets more excitement than he bargained for...and learns some important lessons along the way. This action-packed book will take you on a fascinating journey, hurtling through space at nearly the speed of light. You will find adventure and suspense, danger and intrigue, friendship and acceptance - and a cast of characters who live in a futuristic world, but whose challenges and triumphs may be just like your own.